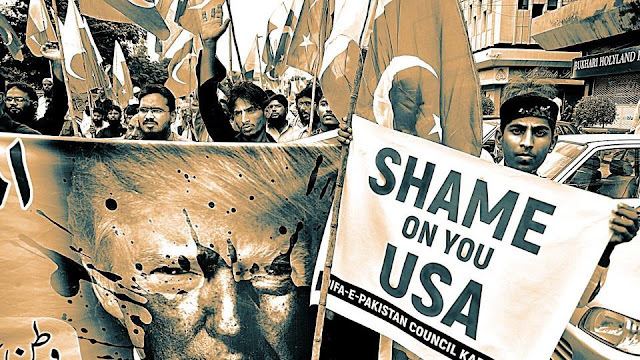 Supporters of Defence of Pakistan Council, a coalition of around 40 religious and political parties, carry banners during a protest against US President Donald Trump in Karachi on August 25. Pakistan is ready with a tough diplomatic policy if the US imposes any sanctions on it or lowers Islamabad’s major non-NATO ally status over failure to crack down on militants, according to a media report. Pakistan’s new strategy comes after US President Donald Trump, while unveiling his new policy for South Asia and Afghanistan, criticised Pakistan for providing safe havens to militants. A day after Trump’s announcement, US Secretary of State Rex Tillerson suggested that US could downgrade Islamabad’s status as a major non-NATO ally if it does not crack down on militants. The Express Tribune reported that the Pakistan government has prepared a three-option ‘toughest diplomatic policy’. According to official sources, the policy includes gradually limiting diplomatic relations with the US, reducing mutual cooperation on terrorism-related issues and non- cooperation in US strategy for Afghanistan. “The last option may include a ban on using Pakistani land for NATO supplies to Afghanistan,” according to the newspaper. However, the policy will be implemented after the approval of the National Security Committee. Meanwhile, the US and Pakistan are expected to sort out their differences during the meetings between their leaders on the sidelines of UN General Assembly session starting tomorrow. Prime Minister Shahid Khaqan Abbasi is expected to meet US Vice President Mike Pence while the foreign ministers of the two countries are also expected to meet.